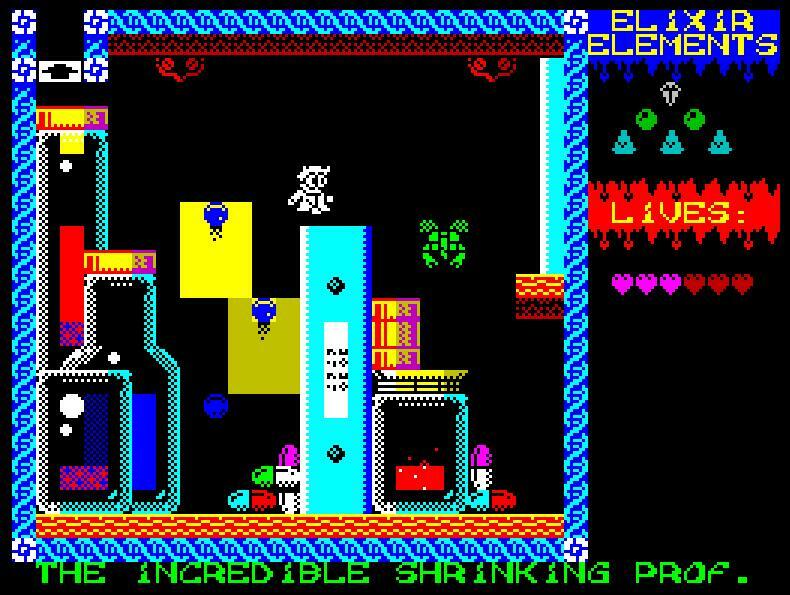 Glorious news for a Monday wake up as I've just found out through Facebook that John Blythe, the same creator behind the excellent Foggy's Quest and the electrically charged Circuitry, is now working on his next ZX Spectrum project as ' Peculiar Perplexing Perils of Professor Poldark: The Incredible Shrinking Professor! ' Looking like a play on Honey I shrunk the Kids, this in development title puts you in the shoes of Prof Poldark who, after seemingly coming under attack by Micro Lipstick Missiles and Micro-Wasp infiltration drones, has slipped into a cocktail of chemicals and got himself shrunk. Unlike the previous game Circuitry, the developer John Blythe has told us his new game will be following similar lines as to Foggy's quest, An arcade adventure style game, but instead will have a goal of certain medical items to find as a cure to your shrinking problem.You'll need to find some growth agents (strange blue triangular tablets), some Elasti-Pills and finally a crystal engorgement stone to drop in a small vat of Catalyst Liquid up on the top shelf! Other than that, this is all we know so far about the game, but apart from the rather eye opening visuals above, all I can say is this game looks like one of his best yet!